Ice cream is a sweet treat that few can resist. Although vanilla is the most popular flavor in the U.S., there are a seemingly endless number of varieties and manufacturers. One of the best-known purveyors is Ben & Jerry’s, the brand synonymous with funky flavors like Cherry Garcia and Chunky Monkey and a groovy Vermont vibe. Who Owns Ben & Jerry's? Ben Cohen and Jerry Greenfield were childhood friends born four days apart in 1951 Brooklyn, New York. You could say that ice cream runs in their veins. During his senior year of high school, Ben drove an ice cream truck. After high school, he attended and dropped out of various colleges in the Northeast, eventually leaving his studies altogether to teach pottery on a working farm in New York's Adirondack region, where he also dabbled in ice cream-making. Jerry started on a more traditional path. After graduating high school, he attended Oberlin College to study medicine, working as an ice cream scooper in the school’s cafeteria. Upon graduating, he returned to New York to work as a lab technician, while applying to medical school without success. During his lab tech days, he shared a Manhattan apartment with Ben. After moving to North Carolina for a few years, Jerry reunited with Ben in Saratoga Springs, N.Y., and they decided to go into the food business together. At first, the pair thought about making bagels but decided the necessary equipment was too expensive. Instead, they settled on ice cream. They decided Burlington, Vt., was an ideal location for a scoop shop because it was a college town without an ice cream parlor. They took a $5 course on ice-cream making and in 1978 opened the first Ben & Jerry’s in a converted Burlington gas station. The original scoop shop became a community favorite thanks to its rich ice cream and creative flavors. Ben and Jerry also made it a point to connect with the community, hosting a free film festival and giving away free scoops on the first anniversary of the store, a tradition that still continues. In 1980, the duo began making pints to sell to local grocers. In 1981, they expanded the operation, opening the first franchise store in Shelburne, VT. In 1983, the company opened its first non-Vermont franchise in Maine and signed a deal with a Boston distribution company. Signature flavors were unveiled throughout the 1980s—including New York Super Fudge Chunk and Cherry Garcia—and by 1987, sales were at $32 million. 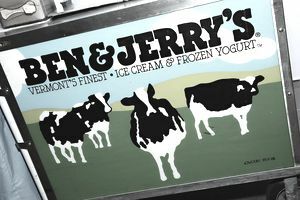 By year's end 1988, with the company operating shops in 18 states, Ben and Jerry earned the distinctive award of U.S. Small Business Persons of the Year from President Ronald Reagan. One reason for the quick popularity of Ben & Jerry’s was its unique flavor combinations. All new flavors were invented by Jerry, usually without any test marketing. Some 1980s flagship flavors include Chunky Monkey, Rainforest Crunch, and Economic Crunch, scoops of which Ben & Jerry’s served up for free on Wall Street following the stock market crash of Oct. 19, 1987. The company’s path hasn’t always been as smooth as its ice cream blends. Ben & Jerry’s faced off with Häagen-Dazs over distribution rights, leading to lawsuits against Häagen-Dazs’ parent, the Pillsbury Company, in the mid-1980s. As the company’s rapid growth continued, it became obvious to the founders that they needed someone with more business acumen to keep the business running. After allowing customers to apply for the job in the “Yo! I’m Your CEO” contest, the company in 1995 selected Robert Holland, a veteran of McKinsey & Co.
Ironically, Holland was found by a search firm, not through the contest. Holland’s hiring brought the company to a crossroads. Ben and Jerry had become the brand’s icons. There was concern that the company would lose its informal hierarchy and unique culture under Holland’s leadership. Ben & Jerry’s had always had a strict pay scale ratio for its management, which it had to break when hiring Holland. Furthermore, Ben & Jerry’s was going through a trying time in the marketplace. Although the company had made its name with wacky flavors and chunky mix-ins, the most popular ice cream flavor in America was—as it remains—plain vanilla. The firm released a line of “Smooth, No Chunks!” flavors to capture that segment of the market who preferred less funky flavors. While the super-premium ice cream market was growing, so was the competition. Häagen-Dazs and Dreyer’s were major players. Ben & Jerry’s historically outsourced some production to Dreyer’s in order to reach customers in the western U.S. Now that Dreyer’s was becoming more of a competitor, Ben & Jerry’s had to worry about its dependence on a competitor for manufacturing and distribution. Holland stepped down in 1996. The following year, Perry Odak became the new CEO, driving sales that year to nearly $174 million. In late 1999, the firm announced it had received notice of interest from other large firms, and in 2000 international food giant Unilever purchased the Ben & Jerry’s brand for $326 million, although the deal called for Ben & Jerry’s to be operated separately from Unilever’s other ice cream brands.